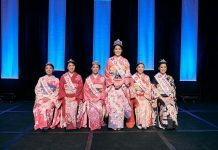 The Japanese Women’s Society Foundation welcomed the “Year of the Monkey” at its annual shinnenkai at Natsunoya Tea House on Jan. 24. The luncheon and brief business meeting was preceded by a bake sale, “Lucky Me” bidding and fukubukuro (surprise grab bag) sales — all fundraisers for JWSF. Entertainment was provided by Rev. Takamasa Yamamura, head minister of the Honolulu Myohoji Mission. Rev. Yamamura received classical training as an opera singer. He graduated from the Santa Cecilia Conservatory of Music in Rome in 2006. Saori Sato was the shinnenkai’s featured speaker. 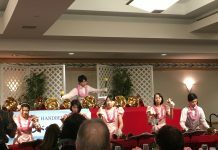 She gave a humorous presentation on “How to Avoid a Faux Pas in Japanese Etiquette.” Sato focused on mealtime etiquette, including the proper way to break apart wooden chopsticks and how to pick them up and put them back down when not eating. She also talked about posture while eating and the dos and don’ts when dining with others. Basically, she said to avoid doing anything that will make your eating companions uncomfortable. 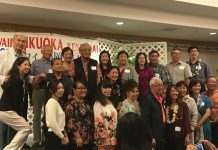 Upcoming fundraising events for the JWSF include “A Taste of Wine and Sake” on Friday, April 15, from 5:30-7:30 p.m. at Waialae Country Club. Tickets for the event are $80 ($25 tax deductible) with proceeds benefiting Kuakini Home and the JWSF’s gerontology scholarship and grant programs. For tickets and information, contact Suzette Lau Hee at bobandsuzette@hawaii.rr.com or (808) 388-8078; or Hiroko Dewitz at hdewitz@gmail.com or (808) 371-0218. Deadline to reserve seats is April 5.